Max Azria makes the sexiest dresses. And for Spring/Summer 2013, he added in the alluring drama of sculptural details, sheer paneling and leather harnesses, inspired by the legend and lore of Helmut Newton's black and white photography and his strong + fierce femme fatale muses. Mashing up the workwear ethic of jumpsuits with the fine lace of lingerie, fluid, long silhouettes graced the runway painted with the patina and vintage wash of chambray offset by muted pinks. 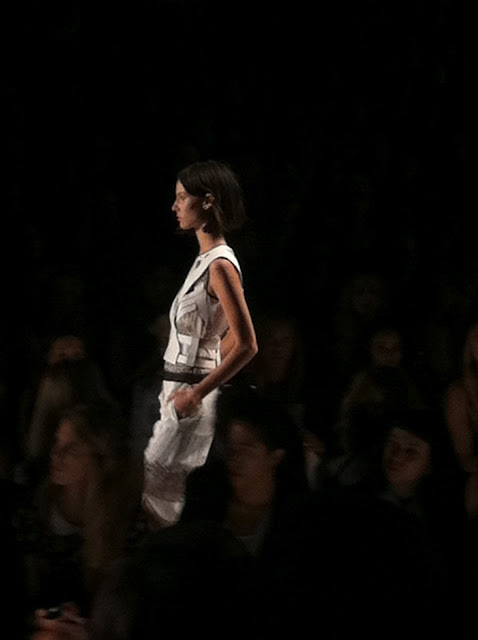 Black and white were shown tonally with the occasional black leather wrap belt or minimalist portfolio style clutch.